The fifth edition of the International Young Chef Olympiad (YCO) organized by the Kolkata-headquartered International Institute of Hotel Management (IIHM, esb 1994) with campuses in nine locations including one in Bangkok and having about 7500 students, will be held from January 28 with the grand finale on February 2 in Kolkata. Contestants from 51 institutions from as many countries will participate. 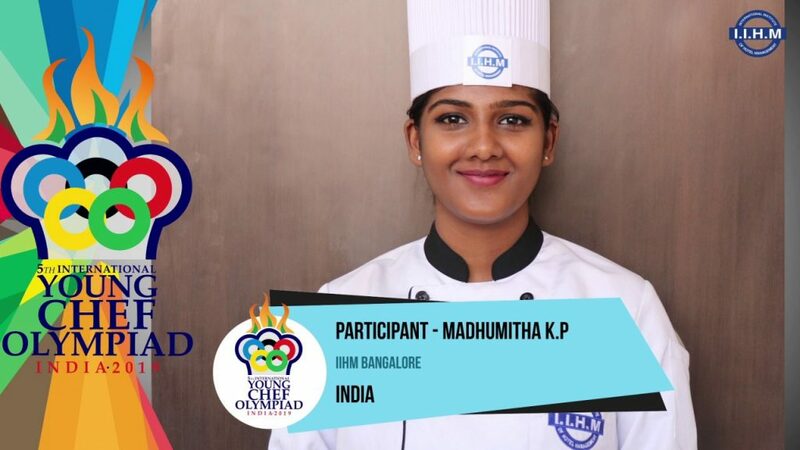 From India, Madhumitha K.P., a third year student at IIHM Bangalore, will represent India in the culinary event being held by IIHM in partnership with the International Hospitality Council (IHC) London. The competition is open to only IIHM students in India. The winner gets a a cash prize of USD 10,000 and a validation of their skills by globally renowned experts from the food and hospitality industry. YCO 2019 will begin on 28th January with a grand opening ceremony at Dr Sarvepalli Radhakrishnan Auditorium in Delhi. The competition rounds will start from 29th January and the first two rounds will be held in Delhi, Pune and Bengaluru. The top 10 contestants as per the scores of the two rounds will compete in the Grand Finale of YCO 2019 in Kolkata on 2nd February. The Plate Trophy is being introduced at YCO this year, for which the contestants holding positions 11 to 20 in the first two rounds will be competing on 2nd February. The Olympiad will conclude on 2nd February with a closing ceremony, where the YCO 2019 Champion, runners-up and other awardees will be announced. The participants will be competing for a total of 18 awards this year, including ‘The Rising Star Award’, ‘Best Vegetarian Dish’, ‘Best Dessert Dish’, ‘Best Hygiene Practice’ and ‘Mentor’s Nomination Award’. The participants will have to prepare dishes inspired from respective national dishes and must inclue at least two local ingredients besides taking care of nutritional quotient, safety, etc. Talking about her plans and preparation for the contest Madhumitha says she is aiming for the gold and make country proud. “I am practicing from 9 am to 6 pm daily in kitchen and am being helped by mentors including the Nagraj from Hyderabad and I am looking forward to put India on the culinary map of the world,” she adds. Madhumitha, who was chosen after six in-house competitions beginning from her own college in Bangalore, has been involved in preparations ever since this year’s YCO was announced some six months back. In her final year with specialization in kitchen, she feels, a win in the competition will help her realizing her career progression once she finishes studies. Madhumitha, who belongs to Chennai, was seven when she began cooking at her home. “My mother was a working parent and I had a younger sibling, who needed feeding. Though we had a nanny, but more often the responsibility came on my shoulders and I had to get into the kitchen. My mother putting apprehensions aside allowed me and that’s how I grew a likening for cooking and kitchen and eventually a passion and choice,” she says. She plans to work in Europe post her education in Bangalore and then return to start her own business. “My dream is to work and learn in Europe and I hope this competition comes as a part of that,” she adds. According to Dr Suborno Bose, Chairman of the YCO 2019 Committee and Founder & Chief Mentor of IIHM, International Young Chef Olympiad, the competition which began with a modest participation of 15 countries five years ago has today become a popular international event in displaying culinary skills as the increasing number of participant shows. “India doesn’t figure anywhere on these kind of international contests in the critical hospitality industry sector, which is so globalized. But we have changed that with staging YCO. This year’s event is by far largest outside a sports event. Like cricket, where India was among the last but then moved up and is today on the top of the world, our attempt is to make hospitality education world-class and make ourselves an important culinary people in the world,” he says while adding YCO is an unparallel opportunity for the participants, who are just beginning their career in this dynamic industry. Chef Sanjeev Kapoor will be the Principal Judge for YCO 2019 while Prof David Foskett (OBE), who is the author of the bestselling book ‘Practical Cookery & Theory of Catering’ and an Emeritus Professor at the London School of Hospitality and Tourism at the University of West London, will be the Chairperson of the Jury. The panel of judges will include internationally acclaimed chefs such as John Wood, Ranveer Brar, Andreas Muller, Enzo Oliveri, Ron Scott, Abhijit Saha, Andy Varma, Enrico Bricarello, Parvinder Singh Bali and David Graham among others. The judges will evaluate the ‘cheftestants’ not only on their culinary skills but also on their ability to efficiently manage a food production area keeping in mind factors like health and safety, good hygiene practice, ability to follow a recipe, culinary skills, creativity, etc.